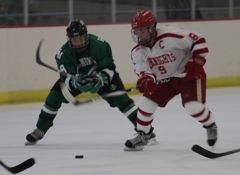 Grant Besse scored two big goals for Benilde-St. Margaret's during a 3-1 victory over Hill-Murray on Saturday, Dec. 4. "We were all working hard," Besse said. "The puck seemed to find me on the backdoor and I was able to put it home. "It could have found any of us sitting there but it found me." Besse's first goal came 26 seconds into the second period after some nifty passing by Pat Steinhauser and Jake Horton. The sophomore forward Besse would find the net again in the third period on the power play as a loose puck came right to his stick. Besse had no hesitation as he buried the puck past a sprawling Hill-Murray goaltender Tim Shaughnessy. 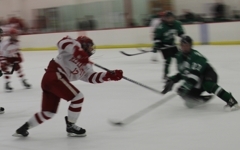 Horton and senior co-captain Patrick Daly assisted Besse's second goal. The Red Knights would have another power play opportunity minutes later in the period and Besse had a chance at the hat trick but his wrist shot rang off the post. "It would have been nice to have the hat trick but it's really all about the win," Besse said. "Playing against Hill-Murray, one of the best teams in the state, it just feels good to get the win." Besse and the Red Knights are sure to enjoy the victory as heavy hitting and penalties highlighted the second period. 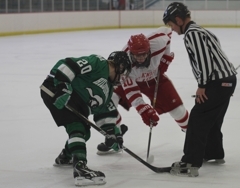 Benilde's Jake O'Borsky and Hill-Murray's Kevin Becker exchanged blows which led to penalties but may have sparked some momentum for the Red Knights. "O'Borsky really helps," Besse said. "He seems to be hitting everything that moves out there. He brings a physical presence that really helps our team." Besse, an MN Elite Underclassman, is playing on a line with Steinhauser, an MN Hockey Hub Super Senior, and Christian Horn, an MN Hockey Hub Junior. Success is sure to follow that line throughout the year. "Those two guys (Steinhauser and Horn) are unbelievable," Besse said. "I get rewarded a lot from their hard work." 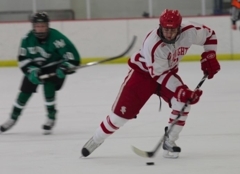 Besse registered 22 points (10 goals, 12 assists) while playing on Team Northwest during the Upper Midwest High School Elite League this fall with current Benilde-St. Margaret's teammates Steinhauser, Horn, O'Borsky and Horton. "Playing with them before the season really helped," Besse said. "We put a little bit together last year but the chemistry seems to be working now that we've been playing together a bit longer. 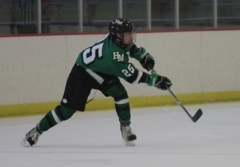 The sophmore forward showed why he is an MN Hockey Hub Elite Underclassman. 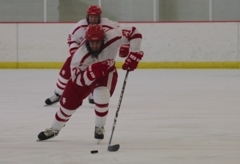 Besse scored twice - including once on the power play - for the Red Knights to lead Benilde to a 3-1 victory. 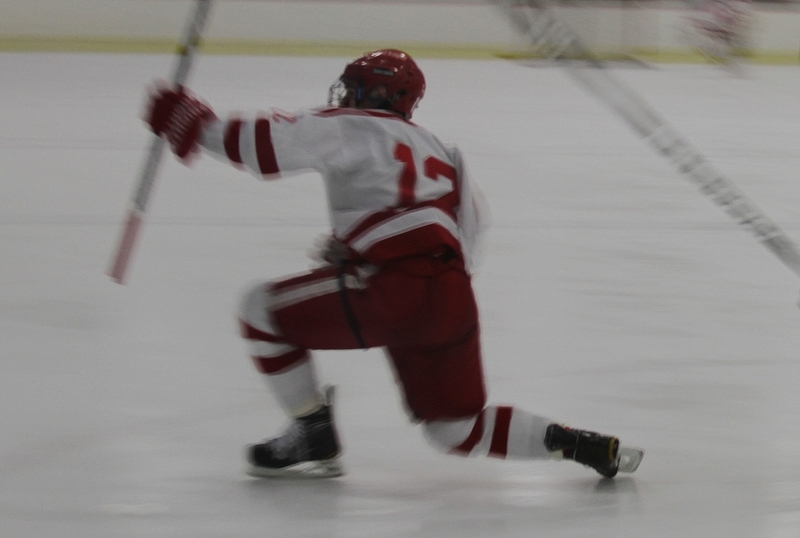 Horton had a hand in every Benilde goal as he scored the first goal of the game in the first period and recorded an assist on both of Besse's goals. The junior defenseman - an assistant captain on the team and an MN Hockey Hub Top Junior - showed his offensive potential while getting the job done on the defensive side of the puck. After recording a shutout victory against Duluth-Marshall, Shaughnessy made 30 saves in the loss. 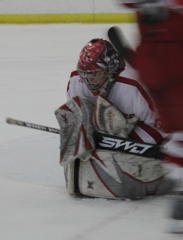 The senior goaltender and MN Hockey Super Senior faced several barrages from Benilde and a total of 33 shots. His saves kept the game close. 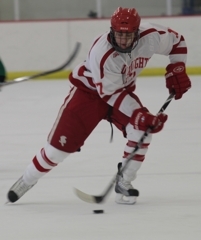 Benilde-St. Margaret's sophomore forward Grant Besse scored twice with senior, defenseman Jake Horton assisting both goals and providing a goal of his own as the Red Knights defeated Hill-Murray 3-1 on Saturday, Dec. 4 at the St. Louis Park Rec Center. Horton drew first blood with an unassisted goal firing a shot past Hill-Murray goaltender TIm Shaughnessy in the first period. Only 26 seconds into the second period, Besse put home a big rebound to put the Red Knights up by two. Horton and Pat Steinhauser assisted on the goal. 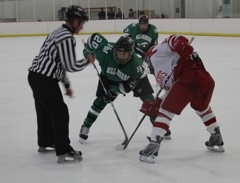 Benilde's lead would be cut in half in the midst of a chippy and penalty-filled second period, on a slap-shot goal by Hill-Murray's J.D. Cotroneo on the power play. 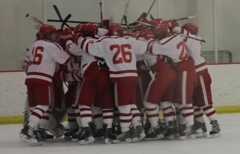 The Red Knights would put the game out of reach on a power-play goal of their own coming from Besse. A scrap ensued in front of the net after Hill-Murray's Shaughnessy was peppered by several shots from the Benilde power play but the officials didn't blow the whiste. The puck came straight to Besse's stick who buried the shot to lift the Red Knights to their second victory of the season. 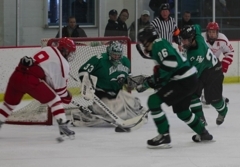 Anders Jecha made 22 saves for Benilde-St. Margaret's and Tim Shaughnessy finished with 30 saves for the Pioneers. 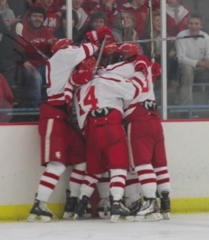 The Red Knights will host St. Francis on Tuesday, Dec. 7 at 7 p.m. at the St. Louis Park Rec Center. The Pioneers will take on the Henry Sibley Warriors on Thursday, Dec. 9 at the West St. Paul Arena at 7:30 p.m.